the mouse is back and so is wall wednesday! even though i didn't go on a deliberate street art safari while in london (it wasn't for lack of desire, more that i simply didn't have time) i still had the good fortune to encounter some marvelous stuff while wandering about. 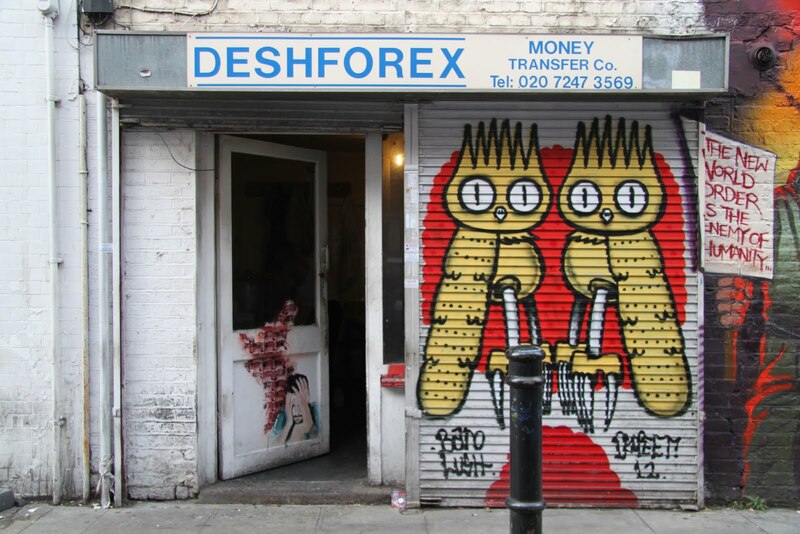 today's three photos were taken on princelet street, which intersects brick lane in east london. turns out east london is nirvana for street art aficionados! 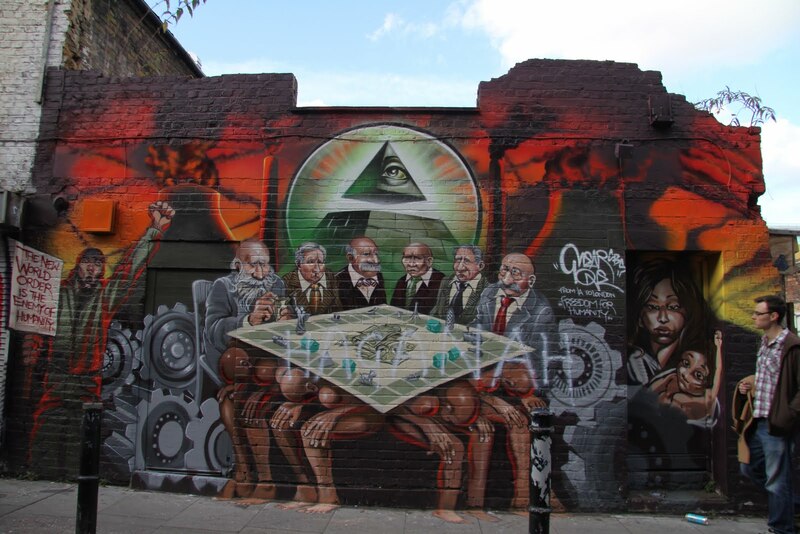 the second photo is of an intense piece done by the visiting artist mear one (aka kalen ockerman). the piece is entitled freedom for humanity - while we were standing there studying it, another bystander said that rumor had it that the piece was going to be whited out in a few days. hmmmm, some power that be must have felt its critique was too radical or maybe its accuracy was a tad too threatening? i don't know about you but i find the piece pretty damned powerful - - and in terms of my world view it is pretty spot on - rich fat cats playing their games on the backs of working people. yeah, sounds about right. curious mouse that i am did a bit of research on the piece (isn't google wonderful). during which i discovered the marvelous stop action video below. the vid was filmed over the course of three days and the artist discusses the meaning of the work and the reactions he encountered while working on the piece. today's posted photos were taken on october 6th; which might have been just days after the mural was finished. i wonder if the work is still up. do any of mouse's visitors know? if so, please leave a comment. 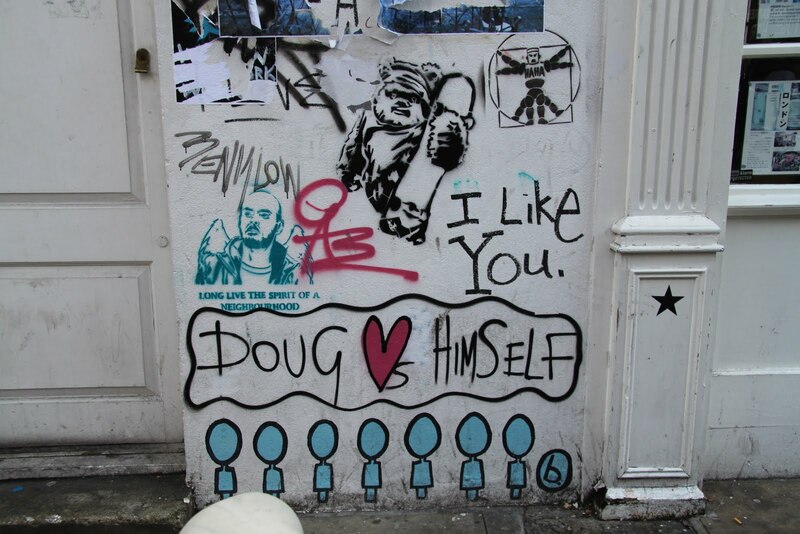 aren't you just tickled by the ewok on the skateboard and the i like you tag? I haven't been over there lately, so I'm not sure whether the mural is still up or not. When I find out I'll let you know. It IS a great piece.